and roar like a weathervane. Hiroaki Sato is the author of Snow in a Silver Bowl: A Quest for the World of Yugen and One Hundred Frogs: From Renga to Haiku to English, among other books. He is a contributor to a greatly expanded adaptation of Naoki Inose’s Persona: A Biography of Yukio Mishima, and the co-editor with Burton Watson of the landmark volume From the Country of Eight Islands: An Anthology of Japanese Poetry, which won the PEN American Center Translation Prize. Sato has translated three dozen books of Japanese literature and poetry, most recently, Cat Town by Sakutarō Hagiwara in the Calligrams series (New York Review Books Classics); The Iceland (a New Directions Poetry Pamphlet), also by Hagiwara; and, with Nancy Sato, So Happy to See Cherry Blossoms: Haiku from the Year of the Great Earthquake and Tsunami. He has also translated various American poets into Japanese, among them John Ashbery, Charles Reznikoff, and Jerome Rothenberg. Since 2000 Sato has written a regular column for The Japan Times. Eliot Weinberger is an essayist, political commentator, translator, and editor. His books of avant-gardist literary essays include Karmic Traces, An Elemental Thing, and, most recently, Oranges & Peanuts for Sale. His political articles are collected in What I Heard About Iraq—called by the Guardian the one antiwar “classic” of the Iraq war—and What Happened Here: Bush Chronicles. The author of a study of Chinese poetry translation, 19 Ways of Looking at Wang Wei, he is the translator of the poetry of Bei Dao, and the editor of The New Directions Anthology of Classical Chinese Poetry and the Calligrams series published by NYRB Classics. His other anthologies include World Beat: International Poetry Now from New Directions and American Poetry Since 1950: Innovators & Outsiders. Among his translations of Latin American poetry and prose are the Collected Poems 1957–1987 of Octavio Paz, Vicente Huidbro’s Altazor, and Jorge Luis Borges’ Selected Non-Fictions, which received the National Book Critics Circle award for criticism. He was born in New York City, where he still lives. Often presented as a “post-national” writer, his work has been translated into thirty languages, and appears frequently in the New York Review of Books, the London Review of Books, and periodicals and newspapers abroad. Forrest Gander is a poet, translator from Spanish, essayist and novelist. He was born in the Mojave Desert and grew up, for the most part, in Virginia. Trenchant periods of his life were spent in San Francisco, Dolores Hidalgo (Mexico), and Eureka Springs, Arkansas. With degrees in both geology and English literature, Gander is the author of numerous books of poetry, translation, fiction, and essays. He’s the A.K. Seaver Professor of Literary Arts and Comparative Literature at Brown University. A U.S. Artists Rockefeller fellow, Gander has been recipient of grants from the NEA, the Guggenheim, Howard, Witter Bynner and Whiting foundations. His 2011 collection Core Samples from the World was an NBCC and Pulitzer Prize finalist for poetry. His novel The Trace was published by New Directions in November 2014. 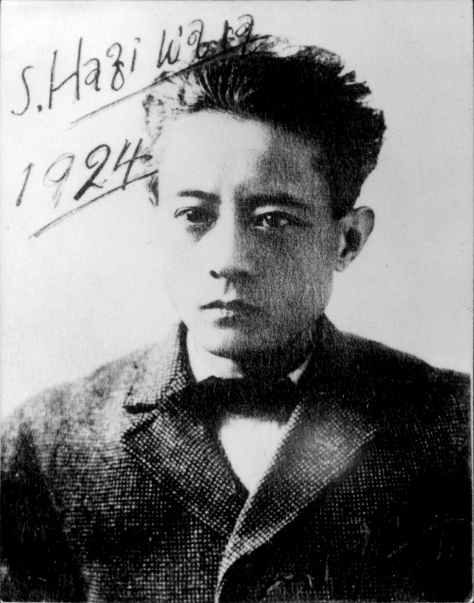 Sakutarō Hagiwara (1886–1942) is a seminal figure in Japanese literature. He broke traditional poetic forms in favor of a free-verse style mixing literary and everyday diction with intense imagery, deep philosophy, and verbal distortions. This is a co-presentation by the Bridge, New Directions, NYRB Classics, and the PEN Translation Committee, PEN American Center.